Sometimes you just want something quick and simple for dinner but that shouldn’t mean boring. This camembert garlic bread is quick, easy flippin’ amazing too. I mean it’s cheese and bread and garlic so it’s hard to go wrong really. You could try experimenting with this bread by stuffing different ingredients in the bread such as tomato sauce, chorizo, mozzarella, basil, pesto, bacon, whatever you want really. Remove all the packaging from the camembert and use the outer box as a stencil to cut a circular hole in the centre of the crusty loaf. Do not cut all the way through. Remove just enough bread so the camembert can sit snuggly in the centre of the bread. Remove the top rind of the camembert and place the cheese in the hole you just cut into the bread, cut side up. With a serrated knife, score the bread several times lengthways and then widthways to achieve a checkerboard effect. Add the garlic, butter, rosemary and a pinch of salt to a bowl and microwave for a few seconds to melt the butter. Spread this mixture between the scored lines you just made in the bread. Sprinkle the whole thing with a little salt and set on a baking tray. Bake in the lower part of the oven for 20-25 minutes until the cheese is oozing, the bread is crusty and the garlic is fragrant. Rip squares of the buttery garlic bread and dunk them into the gooey cheese. Shake your head in amazement. A really simple recipe that uses store cupboard ingredients with a zingy tang from lightly pickled onions. I have found that some vegan recipes are made up of a lot of specialist ingredients that I have never heard of, cost a fortune and would have to buy a huge quantity of to use one teaspoon of before placing at the back of the cupboard for the rest of eternity. However, I urge you to try these vegan offerings. They are made from simple ingredients, real food and taste delicious. This soup is a case in point. To make the lime-pickled onions, combine ½ the lime juice and ½ the onions in a small bowl, and season. Leave to pickle for 30 mins. Meanwhile, heat the olive oil in a saucepan over a medium-high heat. Add the garlic and remaining onions, and season. Cook for 8 mins or until the onions are translucent. Add the spices and chipotle purée, cook for 1 min, then add the beans, stock and remaining lime juice. Simmer for 15 mins, then purée in a blender. Pour the soup into a clean pan to reheat. Serve with a little of the drained pickled onions, topped with a small drizzle of soured cream and some coriander, and the tortillas on the side. Using canned and frozen veg, this easy vegetable curry recipe will be ready in as little as fifteen minutes. 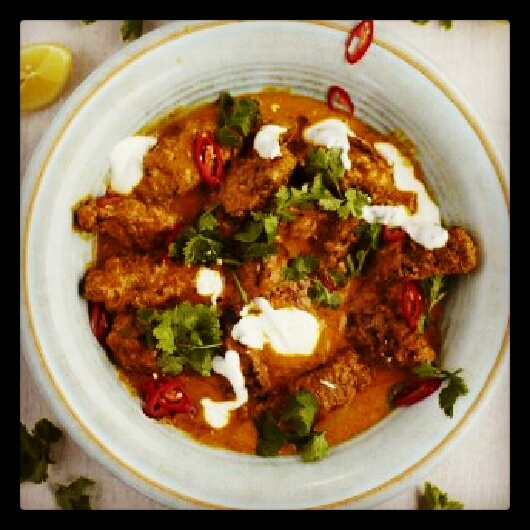 Aromatic, satisfying and healthy, this recipe still delivers when you’re short of time or just simply want a curry fix. Put it on a medium heat until the oil is hot. Test this by adding a few mustard seeds. If they fizzle and pop the oil is ready. Add the cumin and mustard seeds and then quickly add the chopped onion. Fry for a couple of minutes then add the drained chickpeas. Add the salt, chilli powder, coriander and cumin powder and turmeric powder and stir through with a fork. Add the blocks of chopped spinach and a few tablespoons of water and then cover the pan and leave on a medium heat for about 15 minutes. The spinach should then be soft. Turn the heat off, stir the spinach through and then serve hot with rice or bread. I like pitta breads with yoghurt too. These are so easy to make and you can have a tasty meal ready in minutes from leftovers you have in your fridge and larder. I normally go for a combo of protein, dairy and vegetable in the filling. Tasty ideas include: Chorizo, black bean and cheddar; shredded chicken, avocado and hummus; feta, spinach and spring onion; bacon, brie and caramelised onion; mozzarella, basil and tomato to name a few. In a dry frying pan over a medium heat, gently warm a tortilla for a few seconds. Add your chosen fillings to one half then fold the other half on top to create a semi-circle. Continue heating the tortilla for a couple of minutes, applying gentle pressure with a spatula, until it begins to crisp and brown slightly. Gently flip and repeat for the other side until the contents are warm and the cheese (if using) is melting. If making a large portion, spread the filling over the whole tortilla, place another tortilla on top and follow the same process of crisping and browning both sides. Remove from the pan, cut into wedges and serve. It tastes and looks like you’ve spent hours slaving away making this curry but actually, it is very simple to put together and there is a lot of flavour going on too. I have suggested using a curry paste in the recipe. It doesn’t have to be Rogan Josh. Try Balti, Tikka Massala, Korma etc based on your taste but make sure you buy paste and not sauce. Ready made curry sauce is not authentic and not very tasty either. Put the mince into a bowl with salt, pepper, breadcrumbs, ginger and garlic and garam masala. Add a splash of milk then mix and scrunch together with clean hands. Divide the mixture in half, then with wet hands quickly squeeze and mould each half into 6 fat fingers. Put them into the frying pan with 1 tablespoon of oil, turning until golden. 2. Squash the tomatoes into the liquidizer, add the peeled ginger, trimmed spring onions, half the chilli, the coriander stalks, turmeric, honey, curry paste and coconut milk then blitz until combined. Pour into the kofta pan, bring to the boil then simmer for 10 minutes and season to taste. 3. Finely slice the remaining chilli and the coriander leaves and scatter them over the curry, dollop with yoghurt, then serve with lemon wedges, poppadoms and rice.